I love this stuff. A variety of gypsum, it’s beautiful, ranging from looking like solid opaque ice to being clear enough to read through. It was named for Selene, a Greek moon goddess, because of its moon-like glow. Selenite’s structure is fibrous, so some clear flat pieces, if cut correctly, can act like TV rock (Ulexite). If not cut and polished, selenite will leave dust and/or flakes in its wake, but that’s part of its charm. Sweep up the dust and use it on candles or in mojo bags! 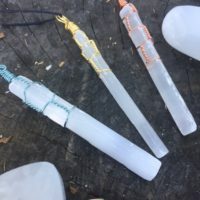 This “fiber optic” property of selenite can help you remember one of its metaphysical properties: to bring clarity of sight. This could mean psychically/spiritually or in the mundane world. I always put selenite into mojo bags for studying or for perceiving the truth of a situation. 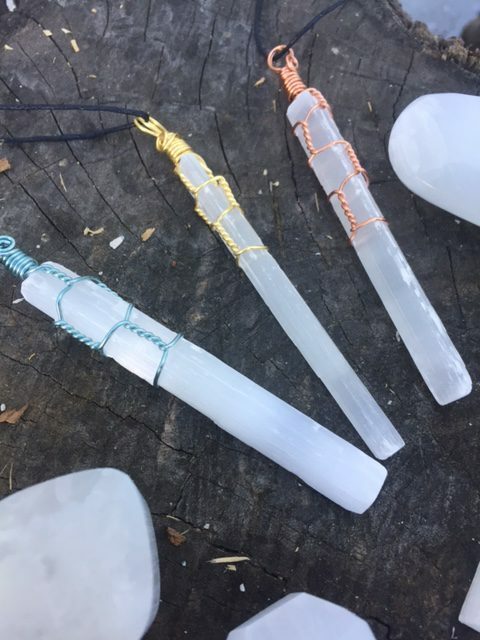 The most useful thing about selenite might be that it can clear and charge your other crystals, and clear the energy in a room (and in you). We’ve found flat pieces that are perfect for lining your crystals up on overnight for a nice charge. For those who prefer the less-polished look, there are raw bars of selenite. 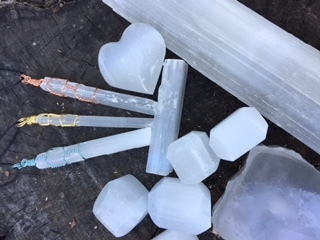 Then there are votive candle holders of selenite (also good for putting other crystals into, if you don’t want to use a candle in it), polished “lozenges,” wands, heart shapes, pendants, etc. Happy Holidays, and if you find yourself in snow, may it be as benign, enjoyable, and helpful to you as flakes of selenite!